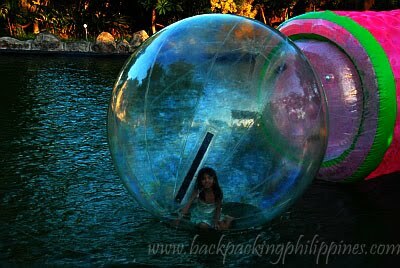 The first time Tutubi visited Enchanted Kingdom was in December 1998 with his friends, this time it's a company-initiated family day where all employees' families trooped to the theme park in Sta. Rosa, Laguna with families in tow all expenses paid. besides the carousel, what's a theme park without the ferris wheel? 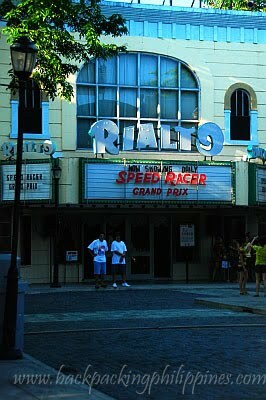 The Rialto ride featured "Speed Racer" that's not really a good one since the point of view is of the spectator and did not feel like you're the one in the cockpit. Tutubi prefers the ride to be a simulation that he's the one driving and not the one watching the race. Space Shuttle Max (not The Zyklon Loop as earlier posted, a roller coaster like ride, picture taken shortly before dusk, the only time Tutubi was able to roam around and take pictures due to the demands of Tutubi, Jr.
Family day ended with a musical titled "Electrifying Kiss of Summer" then capped by a fireworks display at 8pm (that scared Tutubi, Jr. and made him cry). It's family day, bonding with family doesn't have to be expensive even if Tutubi has an unlimited day pass ride-all-you-can ticket. 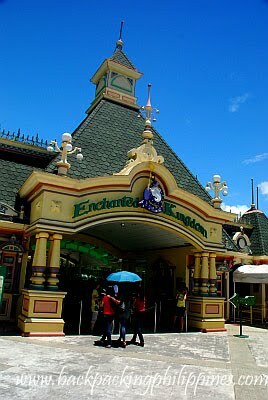 Enchanted Kingdom Entrance Fees(admission prices/tickets), shuttle service schedules, and other information can be found on Enchanted Kingdom's official website or by calling their published contact numbers. 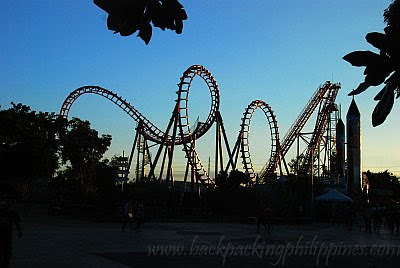 How to get to Enchanted Kingdom? The easiest way is to ride the Enchanted Kingdom shuttle service (fare: P250.00) at Ayala Terminal to and from the theme park. directions to Enchanted Kingdom If you're coming with your own car, from SLEx, take Sta. Rosa exit, turn left after paying the toll fees at the toll gate, drive past over the SLEx bridge then turn right to the road where the ferris wheel is visible. 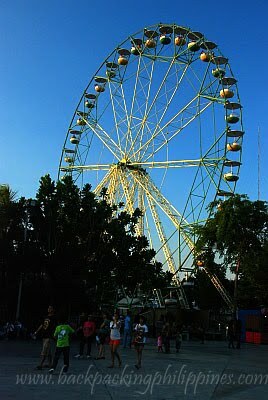 The same corner is also the spot to take tricycles to Enchanted Kingdom for those commuting there. Enchanted Kingdom promos on Mother's day is free entrance for mothers on Mother's day, no information if an equivalent free tickets for fathers on Fathers Day June 20. I was there escorting VIPs in the holy week of 2009. I only got to experience the 3D movie (or was it 4D according to you?). I was just roaming around most of the time and didn't get to experience other rides. tutubi may malapit bang hotels jan? para pag ginabi di na magda drive? hi, i was just wondering, aside from the zorb ball, the water park, the 4D theater and the Bungee fun, are there other new attractions? And btw, would you know if the Bungee fun is only temporarily there or will they be permanently in Enchanted? thanks! dpat lahat ng rides kasali sa ride all you can! kaya nga ride all you can eh! i would like to know kung may malapit bang hotel or inn where my family can stay if ever gabihin na kami sa EK? I visited the theme park before to treat my whole family. It was great and almost the same attraction from other theme park oversea. The best thing is both adults and kids can have fun. I will visit again when im back in philippines.